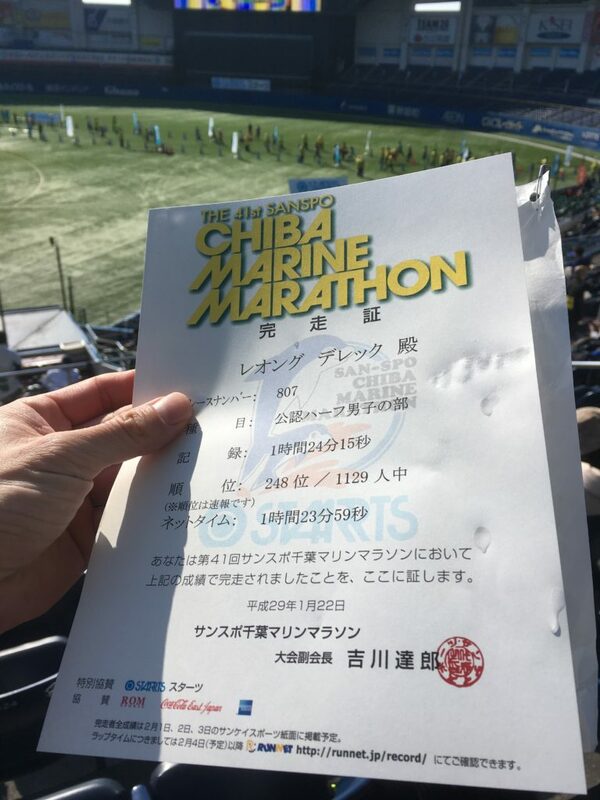 I’ve run this Chiba Marine event twice prior, once in 2014 and another time in 2015, which I recorded Half Marathon times of 1h 25m 01s and 1h 25m 12s respectively. Both times were ran in rather cold and very windy conditions. This year, 2017, I decided to go back and give it another shot, after a year of absence. After all, on paper the race has many things going for it, to name a few: close proximity to Tokyo, relatively flat course, well organised and held in the near-peak of running season. Rather low-key preparation for this. It was mostly mental preparation, as I checked my own previous records of this event, and decided a sub 85 minute (1h25m) target would be a good result. Also noted that the course is wide and therefore the distance would likely be slightly longer than a normal half marathon (21.1k). The other major factor is the strong wind as the course travels along the bay area and there is nearly nothing to stop the often strong gusts of winds. 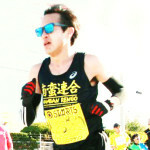 There were at least fifteen members from Namban Rengo running club participating this year which was a great turn out. However, fellow Nambanner and friend, Padraig, noted that the event’s overall crowd didn’t seem that many as compared to previous years. Perhaps the poor weather of years gone by affected the overall participation levels. 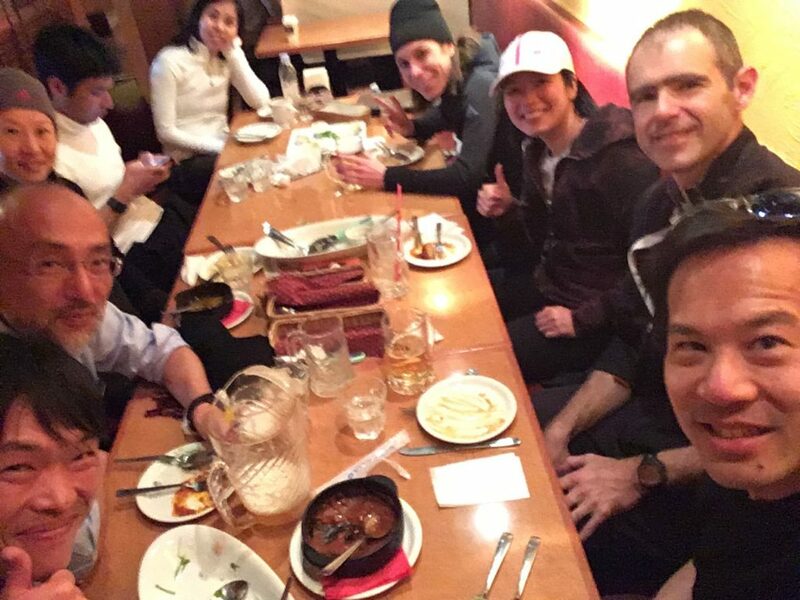 This year’s energetic bunch included, Marie G, Celine B, Pat H, Yuka, Yuki, Eric L, Nizar, Nick C, Harrisson, Padraig M, Yasuo H, Yuichi K, Michael R who all ran the Half Marathon, with Jay J representing the 10k event. We all tried to meet prior and made our ways to the stadium which was nice as the sun was out and it made the day seem almost balmy, a very odd sensation for a winter’s day. More importantly, it did not seem like there was any strong performance-hampering wind. Indeed, the weather was so nice that as the gun went off, I spent a lot of it adjusting my pace to go a bit faster than the 85 minute pace (3m59s) , just to build a small contingency. During bay-side segment of the course (10km to 12km) there was very little wind to speak of, so this made for a pleasant surprise. Things were looking good after that, during the twisty park area. The 15km marker was passed in just under one hour, so things were humming along. … Except then some rat bag who ran from behind me during a rather empty, straight section of the park, cutting right in front of me with no room to spare. It was enough to get my blood boiled for a mandatory knee-jerk reaction to speed up and cut back in front of him. I didn’t look back, we did not make physical contact after all. I heard him swearing under his breath behind me after that, however I’m pretty sure he knew what he did to provoke me to do that. Not recommended of course, but I’m sure you probably would’ve done the same in the given circumstances! Feeling even better after this, the final 19km bridge loomed. Admittedly, it’s not an extremely steep bridge, but it is enough of a challenge to meet with a grimace on your face. 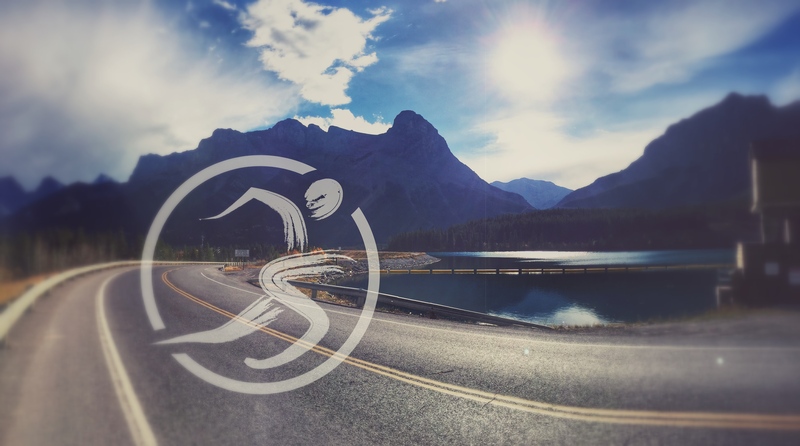 Furthermore, it is positioned right at the tough section because when you’re usually fading, but still with a not-insignificant 2km to go before the finish line. On tired legs, right there, I looked at my watch and decided sub 85 would be easily possible, but how about try to do a sub 84 minute. That made things really challenging. Pushing even harder from that point onwards, I managed to cross the line at 1h23m59s, just scraping through the adjusted target time. Finishing, I collapsed on the ground, feeling really glad to get this race over. Eric was there, giving his perpetual grin. He had finished a few seconds ahead. I really enjoyed this race, probably more this year than any other year thanks to the sunny weather and super running friends. 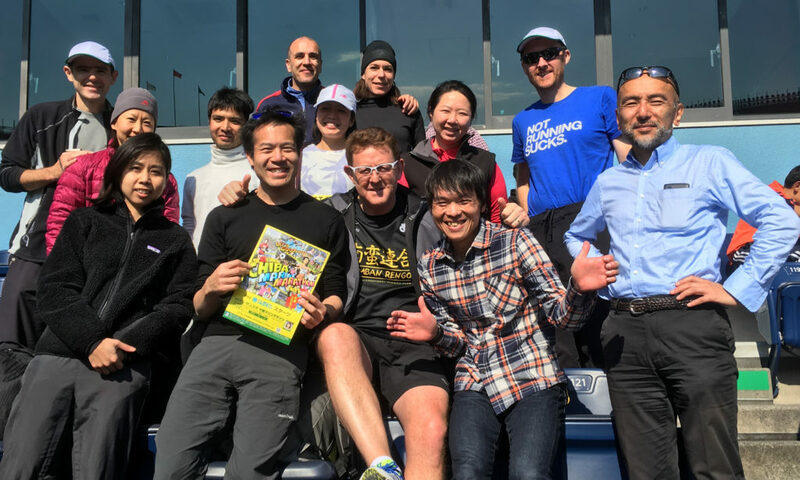 The group of Namban members all completed the race with very impressive times, including five members creating new personal-best (PB) records for the Half Marathon distance. Well done to those who made their records! Not a PB for me, but what I term a new PCR, personal course record, as not all courses are made the same. Capping off the day, we headed to have a well deserved lunch and beverage in a randomly-found but delicious Spanish restaurant on the opposite side of the train station. Thanks Harrisson. So good to see you out there, and all your Padawans did a fantastic job! Thanks Pat! Good work on your run too! Congratulations on the timings. Well written post, i could visualize myself being there.